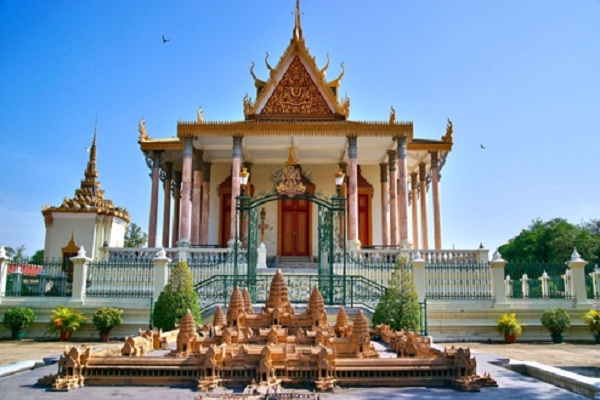 Constructed in 1962 by former King Sihanouk to replace the wooden pagoda built by his grandfather in 1902, the Silver Pagoda is so named because of its 5329 silver floor tiles, each around 20cm square and weighing more than a kilogram. Created in the palace workshops during 1906 and 1907, the gold Buddha weighs in at 90kg. Directly in front of it, in a Formica case, is a miniature silver-and-gold stupa containing a relic of Buddha brought from Sri Lanka. To the left is an 80kg bronze Buddha, and to the right a silver Buddha. On the far right, figurines of solid gold tell the story of the Buddha. The silver pagoda is unique in several ways. It is the pagoda where the King meets with monks to listen to their sermons and where some Royal ceremonies are performed. 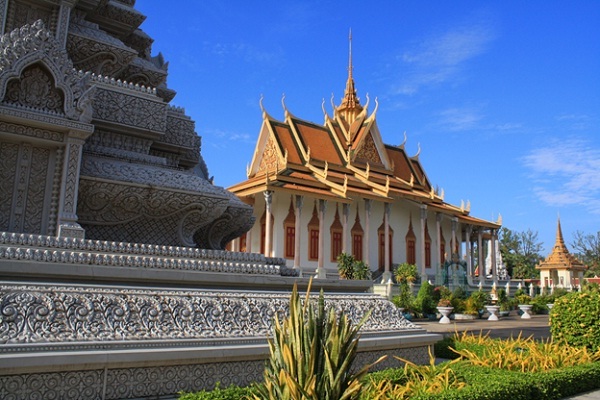 It houses a collection of priceless Buddhist and historical objects including the “Emerald Buddha”. And, unlike most pagodas, no monks live at the pagoda. The silver pagoda opens daily from 8 a.m. to 11 a.m. and 2:30 p.m. to 5 p.m. Entrance fee US$ 3 per person. Camera fee US$2. Videos fee US$5. Photography is allowed in the outside exhibition areas only. Visitors should remember that exposed knees and shoulders are considered disrespectful.